Juicy, healthy and bursting with fresh and vibrant colors and flavours! 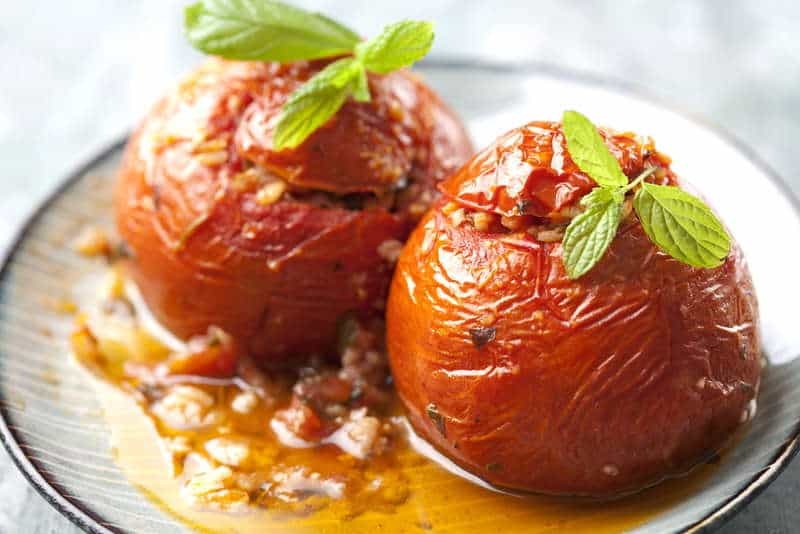 Gemista or yemista (which in Greek means ‘filled with’) is a traditional recipe for Greek stuffed tomatoes and/or other vegetables that are baked, until soft and nicely browned. The traditional Greek recipe for Gemista can be either vegetarian (which in my opinion is the best! ), where the Gemista are filled with rice, chopped vegetables and baked in a tomato based sauce, or they may contain minced beef or pork. There are countless recipes for Greek stuffed tomatoes (Gemista), with almost every household having its own. So feel free to experiment with the stuffing, with different types of herbs and varying amount of spices. Your imagination is your limit with this amazing Greek dish! Some tips to make the perfect traditional Gemista every single time! This traditional Greek recipe for Gemista falls under the category of Greek dishes called “Ladera”, meaning Greek dishes prepared with olive oil. So make sure to use some good quality extra virgin olive oil, which will surely lift the flavor! Although the traditional Greek recipe for Gemista doesn’t call for any butter, a little secret is to add just a little bit inside the Gemista before adding the stuffing for some extra flavor. As the peppers are not as juicy as the tomatoes the stuffing of the peppers always comes out a little dry. To avoid that, spoon some extra tomato juice over the peppers and they will become just amazing. When cooking the Gemista, make sure to cover them with aluminium foil as the steam allows the rice to cook and the vegetables to soften without them ending up being burnt. When tomatoes are in-season they are obviously the best choice to prepare this Greek dish, but for an all-year-round dish you can use eggplants and peppers or even courgettes! Serve these extra juicy, melt-in-the mouth Greek stuffed tomatoes with a block of salty feta cheese and lots of bread. Enjoy! To prepare this delicious Greek stuffed tomatoes recipe, start by washing thoroughly your vegetables. Slice off the top of the tomatoes; using a spoon remove the flesh of the tomatoes and keep it in a bowl. (The flesh of the tomatoes will be the base for the tomato sauce for the Gemista.) Slice off the top of the eggplants and remove the flesh, using a spoon. Cut the flesh of the eggplants in small cubes and set aside, as you will use them later for the filling of the Gemista. Slice off the top of the peppers and remove the seeds and white parts from the inside. Place the empty vegetables on a large baking tray. Try to leave the vegetables as thin as possible, leaving just a little of the flesh, but be careful not to poke through their skin. Season the empty vegetables with a pinch of salt and sugar and add a little butter on the bottom of each one. Prepare the sauce for the Gemista. In a blender add the flesh of the tomatoes, 5-6 tbsps olive oil, the tomato puree, sugar, season with salt and pepper and mix to combine. Set aside. Prepare the filling for the Gemista. In a saucepan add some olive oil and sauté the onions, until translucent. Chop the zucchini in small cubes, add in the saucepan and sauté for one more minute. At the end add the flesh of the eggplants (chopped) and the chopped garlic and sauté, until softened. Add the rice and continue sautéing, unit it becomes transculent. Pour in 1 tin chopped tomatoes and season with salt and pepper. As soon as the liquid has been absorbed, the stuffing is ready. Remove the pan from the stove and stir in the fresh herbs. Assemble the Gemista. Spoon the filling inside the empty vegetables and place the potatoes, cut into pieces, in between the vegetables. Season with salt and pepper and pour the tomato juice (sauce) over the vegetables and in the baking tray. Cover the vegetables with their lids and add 2-3 glasses of water. Cover the Gemista with aluminium foil and bake in preheated oven at 180 degrees for 60-75 minutes. Halfway through cooking time remove the aluminium foil and bake, until nicely coloured. The Gemista are equally delicious, served either warm or even straight out of the fridge. Just pair them with some salty feta cheese and enjoy! In step 2. we are preparing the sauce.. in further steps I don’t see where you use it..
Hi Natasa, it is used in step 4, I have added a clarification to the recipe. I’m loving this dish and I’d like to include it in a post I’m doing about Greek food, it’s history and origins. Of course, I would give all credit and links back to you and would not print the recipe. Could you let me know if I have your permission, please? Thanks so much. You do not cook the rice before stuffing. It will cook in the tomato juices when in the oven. Dear Kathie,its said”make sure to cover them with aluminium foil as the steam allows the rice to cook”, so there is no need to cook the rice. Looks incredibly delicious. Just try! How much time does it take to make it? how much is a tin of tomatoes? While it may taste good, there is no use of zucchini, eggplant and certainly never butter or sugar in this dish, if you want to call traditional.Greeks dont use butter in their cooked food, only olive oil.That is why it is healthy. This, like other dishes here though very appealing,ARE NOT TRADITIONAL, but americanized to appeal to north american palates, or cookedin tourist areas for foreigners in Greece. I go to Greece often, and have traditional recipes from many parts of Greece.One thing they all have in common, is their simplicity and purity of ingredients. Good effort though.Just dont call it traditional. My yiayia sometimes uses eggplant in her gemista, and while she doesn’t use butter in this recipe, she uses it in many others. It might not be traditional in your family, but it obviously is in someone else’s. Thank you for your email on Easter recipes. My wife loves gemista and I cooked for her your recipe for Easter we both love it. As I have cooked gemista many times over in my life I found your secrets really did make a deference in the cooking. The butter and the risotto rice it worked wonders. Pingback: Gastronomía vegana en… Atenas – ¡Leven anclas!